New for fall 2019, incoming freshman and sophomores can participate in a program called Early College High School. 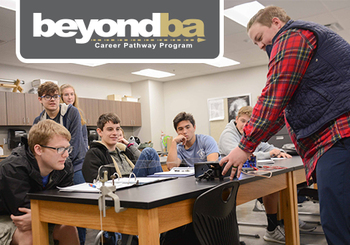 This program allows students to take high school level courses on the Northeastern State University-Broken Arrow campus while simultaneously equipping them to successfully undertake college coursework upon completion of 10th grade. Data from the National Student Clearinghouse Research Center shows that time in a postsecondary classroom during high school can lead to more college-going behavior. It also supports the “Power of 15,” an initiative based on studies indicating that students who leave high school with 15 college credits are more likely to attend college and stay there longer. This program also saves parents money for college and increases first generation college attendees. Additional student benefits of Early College High School include peer/study groups, a smaller learning environment, ease of college enrollment, easier transition after high school, increase in college grades and more focused support for college entrance scores. All courses will be taught by Broken Arrow teachers. Students in athletics and fine arts are able to participate and still meet necessary requirements. Details regarding transportation and daily schedule are still being ironed out. Interested in learning more? The district is hosting four forums to inform students and parents about this opportunity. All forums will take place at 6:30 p.m. at the Broken Arrow Freshman Academy on the following dates. For more information, please contact the district’s instructional team at 918-259-7725. 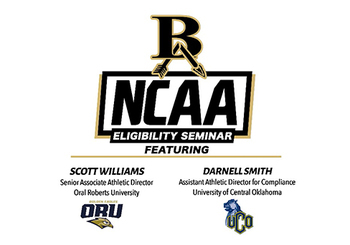 Broken Arrow Public Schools Athletic Department will present its first NCAA Eligibility Seminar for district student athletes and parents on Wednesday, April 24, at 6:30 p.m. in the Broken Arrow Performing Arts Center, 701 S. Main. The seminar will cover such topics as NCAA Division I and Division II eligibility requirements, amateurism and recruiting calendars. Featured speakers for the evening are Scott Williams, senior associate athletic director at Oral Roberts University, and Darnell Smith, assistant athletic director for compliance at the University of Central Oklahoma. Williams, who served as assistant athletic director for compliance at ORU from 1998 to 2005, has also worked as NCAA Athletic Certification liaison and was a member of the NCAA Athletic Certification Steering Committee. After leaving ORU in 2005, Williams went to Oklahoma State University where he was the Assistant A.D. for Compliance for one year before being promoted to Associate A.D. for Compliance. From 2009 to 2014, Williams was the Senior Associate Athletic Director at UCO, where he was responsible for the internal operations of the department. Smith is in his seventh year at UCO. He manages the areas of NCAA compliance, student-athlete services and the Student-Athlete Advisory Committee while also directing student-athlete welfare programming and serving as Deputy Title IX Coordinator for Athletics. Smith joined UCO after a stint at the University of New Mexico, where he served as Director of Compliance for more than a year. In his role with UNM he managed 11 sports by maintaining institutional control in all aspects of compliance. A native of San Antonio, Texas, Smith was a four-year member and two-year starter on the Oklahoma State football team from 2002-2006. He was named OSU’s Senior of Significance and Outstanding Senior while he earned a Bachelor’s of Arts Degree in Economics. He also earned a Master’s of Science in Natural & Applied Sciences at OSU and served as a Graduate Assistant for the Office of Athletic compliance. 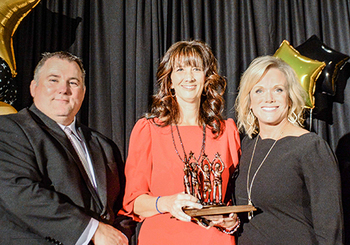 At its annual Star Awards Gala, Broken Arrow Public Schools announced Broken Arrow High School teacher Jeanie Moore as the 2019 District Teacher of the Year and bus driver Shirley Walls as the district’s top support employee. During this event held at Stoney Creek Hotel and Conference Center in Broken Arrow, 28 Site Teachers of the Year were formally introduced, five were named as finalists and one was honored as the District Teacher of the Year. As Teacher of the Year, Moore received a monetary gift from the Broken Arrow Public Schools Foundation and the opportunity to drive a courtesy car from Mathews Ford in Broken Arrow. She will go on to represent the district at the State Teacher of the Year Competition this summer. “I want my kids to learn English, but more importantly, I want my kids to learn compassion, kindness, self-respect and confidence; it is then I have contributed my best to education,” said Moore. In addition, five staff members were recognized as Support Staff of the Year finalists, and bus driver Shirley Walls was presented with the Beyond and Above award for consistently going the extra mile in support of the district’s goals and objectives. 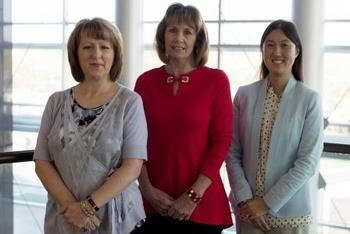 Nominations for the Beyond and Above award were made by principals, teachers, administrators, supervisors and coworkers. A committee consisting of site and district administrators conducted a review of all candidate nominations before spring break. Flintco helped sponsor the Beyond & Above Award, providing cash prizes to each of the five finalists. 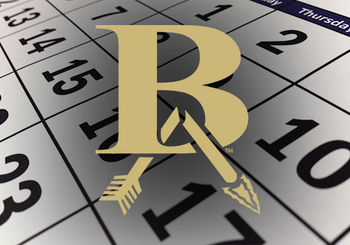 To optimize district funding, the Broken Arrow Public Schools Board of Education approved an altered 2019-20 instructional calendar during their regularly scheduled meeting on April 15. 1) First day of school for kindergarten through 12th is now starting at a later date on Aug. 21, 2019. Late Start Wednesday will begin the following week on Aug. 28. 2) First day for Pre-K is Aug. 23, 2019. 3) School is now in session on Presidents Day, Feb. 17, 2020. 4) The tentative last day of school is May 28, 2020. This date includes three built-in weather days. The district apologizes for any inconvenience this may cause families as they plan for the upcoming school year. Please view the new instructional calendar and contact Melissa Addison at maaddison@baschools.org with any questions. Broken Arrow Public Schools’ finance department was recently honored with its sixth Certificate of Excellence in Financial Reporting award for exceeding the high standards for financial reporting and accountability. The district was recognized by the Association of School Business Officials (ASBO) International for completing the Comprehensive Annual Financial Report (CAFR) for the fiscal year ending 2018. Broken Arrow Public Schools is one of three districts in the state to successfully complete the CAFR. State law mandates that school districts undergo an annual audit and publish a complete set of financial statements presented in conformity with accounting principles generally accepted and audited in accordance with auditing standards. The primary difference between a typical audit and a CAFR is that the audit shows a single year of financial transactions, while the CAFR contains the results of the period with historical information. The CAFR adheres to the most rigorous federal standards set by the Governmental Accounting Standards Board. The ASBO Certificate of Excellence award confirms the school business office’s commitment to financial responsibility. Recognition through the program strengthens a district’s presentation for bond issuance statements and promotes a high level of financial reporting to the community. The CAFR report is available to any individual or organization wishing to compare the district’s financial state to other schools or businesses that complete a CAFR. For more information about the award, please visit ASBO’s website at www.asbointl.org/COE.